I am sorry to hear you are having problems with your cartridge. There are some simple troubleshooting steps you can try that work more often than not. If you take out the cartridge that is not being recognised and put it to one side, then switch the printer off at the wall. If you leave the printer off for ten minutes, this will allow the printer to reset. If after ten minutes the cartridge is still not recognised, please contact a member of the team with your order reference number so that we can look further into this for you. I'm told that unless they are genuine Epson cartridges, they will not work in the Epson SX435W printer because Epson send out messages to the printer to stop your printer using compatible cartridges. How will your cartridges be any different? I previously bought compatible ink cartridges for my Epson SX435W printer, only to find out the printer wouldn't read them. I would like to buy your premium cartridges, but am worried I will have the same problem. Could you please advise? Our compatible Epson Stylus SX435W ink cartridges are fitted with the correct chip so you shouldn't have any problems installing them directly into your printer. We also offer you a 30 day money back guarantee on compatible Epson SX435W cartridges so you can return any unsatisfactory items to us for a full refund if necessary. I ordered compatible T1295 ink cartridges for my Epson SX435W printer. However, this printer model number doesn't appear on the box of the cartridges which you've sent - only SX425W appears. Presumably, these compatible Epson T1295 cartridges will fit mine too, but I don't want to open them until I'm sure they are correct? Thank you. We can confirm that our compatible Epson T1295 4 colour multipack cartridges will work in your Epson Stylus SX435W printer. You can check the compatibility on our website in two ways. Any item listed on the printer page will go in your printer. You're currently on the printer page for SX435W so all of the cartridges listed here can go in your machine. Alternatively, we provide a full compatibility list for each specific product. Therefore, if you click on the item "Best value premium brand set of Epson SX435W ink cartridges" you'll be taken to a new page. Under the heading, "This item is guaranteed to work in the following printers:" is a list of every printer that can use the compatible T1295 multipack, including the Epson Stylus SX435W printer which you have. 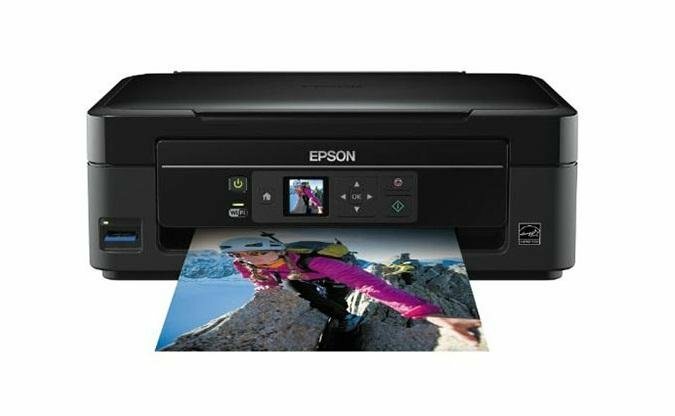 Is the Epson SX435W an inkjet printer just before I buy a ream of paper? Yes, the Epson SX435W is an all-in-one inkjet printer that is part of Epson's Small-in-One range of devcies. This machine can print, sacn and copy wirelessly. It uses four separate ink cartridges which are available in regular or high capacity sized cartridges. The SX435W inkjet printer should work fine with A4 paper or you can use photographic paper. I've tried to use non-Epson cartridges in my Stylus SX435W printer but the printer refuses to acknowledge them. Would this be the same with yours? Provided that your printer was purchased in the UK then the compatible Epson Stylus SX435W ink cartridges that we stock should function correctly in your printer. They've been fitted with the correct chip so you can install them directly into the printer without any problenms. If you ever receive cartridges from us that don't work in your printer then simply contact us and we'll be able to replace the cartridges or offer you a full refund. I've been told that my Epson SX 435W printer has softwear which rejects compatible ink cartridges. I 've tried Jetplay ones and the printer will not accept them? Annette Nodwell. Unless you've installed some additional software from the type that is bundled with your printer, prohibiting the use of compatible cartridges, we cannot see any reason why our compatible Epson Stylus SX435W ink cartridges wouldn't work for you. We do have a 30 day money back guarantee to ensure that the cartridges we supply you with are satisfactory. I bought some ink cartridges for my Epson Stylus SX435W off another supplier. The numbers on the ink cartridges are the same as those on the printer but when I changed the ink cartridges, the printer is not printing. Could it be the cartridges as it is a new printer? Should I try a new set of ink cartridges. or just try changing them one at a time just in case one of the cartridges is faulty, or could the printer be faulty? I've cleaned the heads and done what the manual says too but it's still not working. Thanks, Marie. - Remove the four cartridges from the printer and switch it off for about five minutes. Wipe the chips on the cartridges with a dry cloth before reinstalling them. If you're still getting the same errors I would recommend contacting the supplier of the cartridges for further assistance. I would not recommend opening another pack of cartridges without speaking to the supplier of the cartridges first. The Epson Stylus SX435W is part of Epson's Small-in-One printer series. The Stylus SX435W inkjet printer allows you to print direct from a memory card, with its LCD screen and navigation buttons. Meanwhile, the WiFi connectivity allows you to upload prints direct from your phone or electronic device  this is a great compact home device, now available at a knock out price. Featuring a black gloss finish, with a modern sleek design, the Epson Stylus SX435W measures only 145 x 390 x 300mm, while the 3.6 cm LCD screen at the front of the device allows you to navigate using simple directional controls. The paper tray can hold up to 100 sheets which is perfect for a home device. The SX435W AIO colour inkjet printer also comes with a flatbed scanner. The Epson SX435W all-in-one has fantastic connectivity, with WiFi allowing you to print from your laptop or mobile phone, meaning that multiple users in your home can print at any time. The addition of memory card slots is also a nice time saving feature. Print speed is great, 33ppm in black, and 15 ppm in colour - this surpasses what is expected of a home device in this price range. Finally the scanner really allows you to make the most of the photo printing functions in this printer. The Epson Stylus SX435Ws paper capacity could do with being slightly larger and the addition of a USB slot would have been a nice touch, plus the 4-ink cartridge technology can be expensive when you need to replace them all. Overall, the Epson Stylus SX435W wireless all-in-one printer is great for a busy household, not concerned with print cartridge replacement costs.